Join us for our spring season 5k on Thursday, June 13, at Icahn Stadium on Randall's Island! Get ready for the celebration with hundreds of girls, building confidence through accomplishment. More information is available on our 5k page! Engaging girls in outdoor activities boosts confidence, creates healthy habits, and leads to the development of life skills beyond what is taught in school. Jasmine Benitez (Rocking the Boat) on her work providing educational and recreational experiences to high school girls using the Bronx River as their classroom. Kathi Krause (Dirt Rock and Root Training) specializes in mountain biking coaching for women and girls, and is also the GRiT Coordinator for NICA New Jersey. Allison Hauser (Girls on the Run NYC) will speak to the challenges facing outdoor recreation and leadership for girls in New York City, including how barriers can be overcome. Beverages will be provided by Sapp, snacks by Honey Stinger, and raffle by REI. This event is free and advanced registration is required. You can learn more and sign up on REI’s site here. 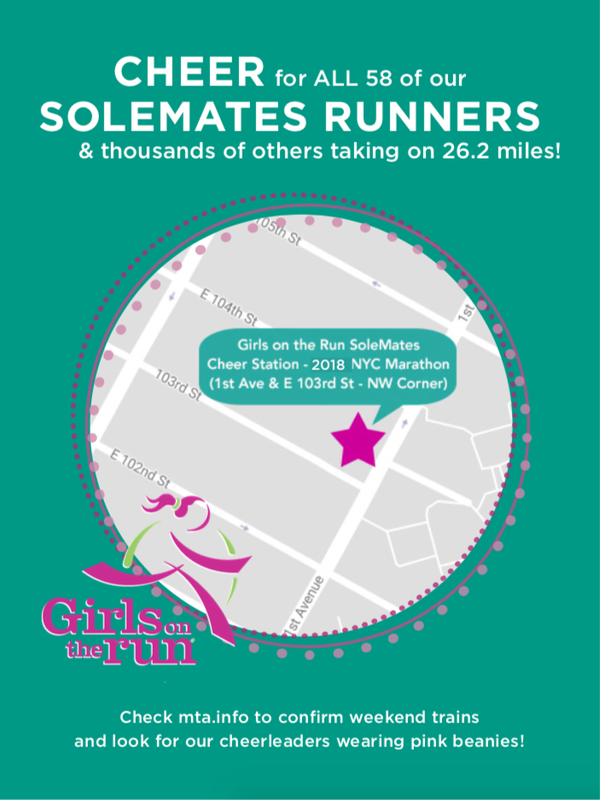 You can join Girls on the Run NYC as a SoleMate in the 2019 TCS New York City Marathon! 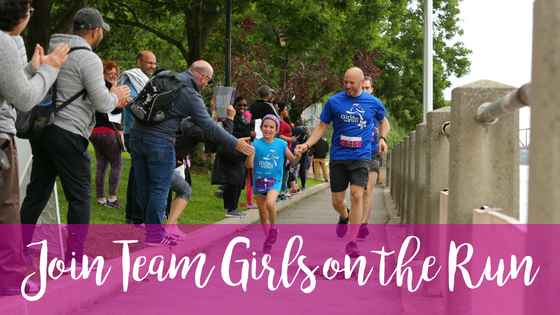 Raise funds to allow us to inspire confidence & joy in more girls while you train for this incredible race on November 3. Register with Girls on the Run NYC to get guaranteed entry. More information about fundraising requirements and registrations details here! You can also join our team if you already have entry, setting a fundraising goal of $1,000. Save the date for our fall season 5k on Sunday, December 8, at Icahn Stadium on Randall's Island! 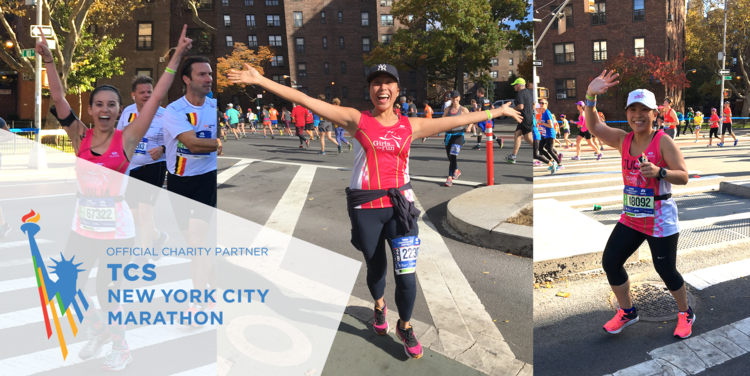 Cheer for our 2019 NYC Half Marathon SoleMates! Help us celebrate the amazing achievements each of these runners has made by not only raising funds for the girls who participate in the GOTR NYC program, but also for running an incredible race! The SoleMates Committee will be hosting a cheer station located at 60th Street in Grand Army Plaza, just west of 5th Avenue. Stop by any time! Do you have entry into this race already and want to join our Team SoleMates? More information here! At 10:30am on Sunday, March 10, Bluestone Lane, Girls on the Run NYC, and Outdoor Voices Run for Women. Join our teams in making a move this International Women's Day and walk, run or jog on a 2-3 mile route through Central Park. Start at 1085 5th Ave with Outdoor Voices swag, and finish back at Bluestone Lane with coffee and snacks. Runners are asked to donate between $5-50 during their run, and all funds will be donated to Girls on the Run councils in NYC. Work out for a cause with the Girls on the Run NYC February Fitness Series, every Saturday in February and early March 2019. Every Saturday morning (9 am) this February and early March, we’re holding unique, challenging, and fun fitness classes at Athleta Flatiron. After each class, we’ll be hosting a warm, post-workout breakfast, including local coffee and granola. Four different classes, four amazing instructors, and four exciting ways to rise to your New Year’s Resolution. Proceeds from every class support Girls on the Run NYC’s work to build confidence, character, and leadership for girls throughout all five boroughs. There’s no better motivation than committing to step, plié, box, and stretch your way through February with a strong, vibrant, and caring community of Girls on the Run NYC supporters. And, since every single dollar raised goes towards girls’ leadership, you’re sweating for a great cause. *If you have any questions about registration, send our team an email at info@gotrnyc.org and we’ll help you sign up! All classes are held at Athleta Flatiron. Save the date for our Fall Season 5k on December 9, 2018, at Icahn Stadium on Randall's Island! Get ready for the celebration with hundreds of girls, building confidence through accomplishment. Registration is now open for runners and volunteers on our 5k page! Support Girls on the Run NYC's Annual Campaign! The SoleMates Committee will be hosting a cheer station located at 1st Avenue & East 103rd Street (northwest corner) for our 2018 TCS New York City Marathon SoleMates. Stop by anytime between 9 am and 4 pm! RSVP (optional) here and share with friends! 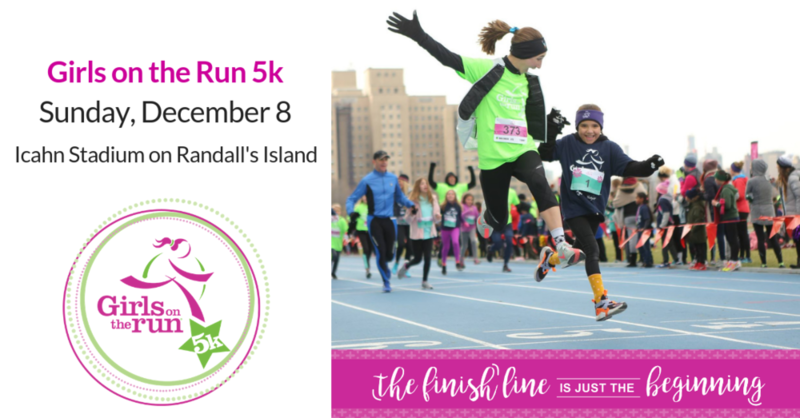 Run the Staten Island Half on October 14 to raise funds for Girls on the Run NYC! Join other runners as they celebrate the vibrancy of Staten Island by running the NYRR Staten Island Half Marathon. As a part of the NYRR Five-Borough series, the Staten Island Half run promises to be a celebration of Staten Island, its diversity and character, and a fun event prompting all runners, community members, families, and friends to get out and get moving! Visit www.nyrr.org/races-and-events/2018/nyrr-staten-island-half to officially register and for more information, then click here to sign up to be a SoleMate! *Girls on the Run NYC does not have guaranteed entries into this race. Choose Your Own Race and run the Staten Island Half as part of Team Girls on the Run NYC! Run any race in your area in support of Girls on the Run NYC. If you have your own entry into an upcoming race or event, click below to register to be a SoleMate! You'll receive our support in fundraising & training plans for different distances, and will be invited to any current SoleMates events along with fun Girls on the Run events! Run the Bronx 10 Miler on September 30 to raise funds for Girls on the Run NYC! Boogie down in the Bronx with a 10-mile race through this vibrant New York City borough. As a part of the Five-Borough series, the Bronx 10 Mile run promises to be a celebration of the Bronx, its diversity and character, and a fun event prompting all runners, community members, families, and friends to get out and get moving! Visit nyrr.org/races-and-events/2018/new-balance-bronx-10-mile to officially register and for more information, then click here to sign up to be a SoleMate! *Girls on the Run NYC does not have guaranteed entries into this race. Choose Your Own Race and run the Bronx 10 Mile as part of Team Girls on the Run NYC! Join the Hamptons Marathon & Half on September 29 to raise funds for Girls on the Run NYC! Participate in the Hamptons Marathon and Half run as a Choose Your Own runner for Girls on the Run NYC! The Co-founder and Race Director for the event, Dianne Weinberger, is both a board member of GOTRNYC and a strong advocate for building confidence through movement. Visit hamptonsmarathon.com to register officially for the race and for more information, and then click here to sign up to be a SoleMate! Do you want Guaranteed Entry into the race? Reach out to us! Chelsey Korus' teaching and movement philosophy comes from her passion for life and the inspiration she finds from nature. She approaches life through the lens of constant learning and loves to share the wisdom she's gathered along her journey in hopes of helping others become AWAKE; to be aware and present in their own lives. Chelsey teaches to crowds of thousands at Wanderlust festivals and currently partners with Adidas and Stella McCartney. She has been featured on PopSugar, the Kelly and Michael Show, Elle Magazine, Prevention Magazine, Fitness Magazine, Shape Magazine, Women's Health, Yoga Journal, GNC's "Respect Yourself" campaign, and YogaGlo. Join Chelsey to welcome in one of the last summer evenings of the season - a limited entry class led by one of yoga's foremost teachers and philosophers - all while supporting girls leadership! Afterwards, join us upstairs at Athleta for snacks, drinks, and gift bags! Passes include entrance into a limited class of 30, yoga mat and blocks, Athleta sponsor gift bag, and a post-session reception with food and drink. SuperStar Supporter Passes include a pair of Athleta leggings of your choice (valued at $89.00 - $98.00). Your ticket and donation for this class make it possible for Girls on the Run NYC to reach more girls in NYC, providing 10 weeks of experience-based sessions, and all the tools that each girl needs to build their confidence, character, and competency. At the end of each season, girls run a celebratory 5k, showing them that they can achieve anything they set their minds to. Every single ticket and donation makes a huge impact on the lives of girls in our city. Tickets are non-refundable. If you cannot attend, your ticket will be processed as a donation to Girls on the Run NYC. * 100% of proceeds from this 90 minute yoga session go to Girls on the Run NYC, supporting our mission to build a world where every girl knows and activates her limitless potential and is free to boldly pursue her dreams. Join the third Mile High class benefiting Girls on the Run NYC! 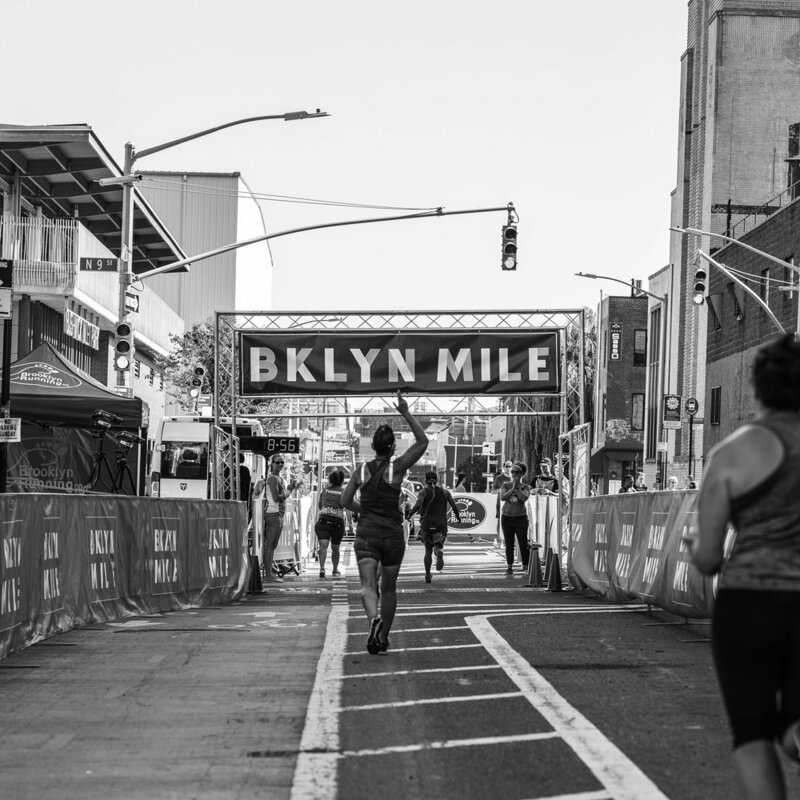 The Brooklyn Mile has partnered with Mile High Run Club, NYC’s only boutique running studio experience. On Friday evening (8/10) at 7:15pm in Mile High's NOHO location, there will be a Brooklyn Mile-focused class taught by Coach Raj. And it's a charity run! 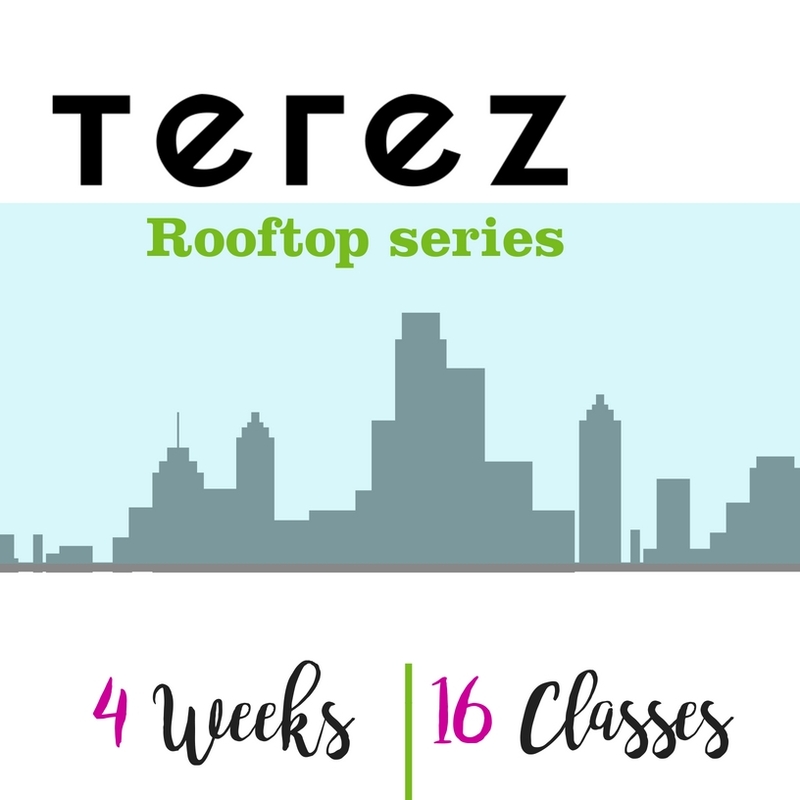 This summer we are partnering with Terez in order to bring together our phenomenal fitness community to empower the next generation of women in New York City through the Terez Rooftop Series. Together we are hosting fitness classes on Terez's picturesque rooftop throughout the summer to benefit Girls on the Run NYC. There will be new classes Monday through Thursday for the next three weeks. To see the schedule go to terez.com/pages/rooftop-series. Registration for classes opens on Classpass at noon on the Thursday prior to each week! Join the second Mile High class benefiting Girls on the Run NYC! The Brooklyn Mile has partnered with Mile High Run Club, NYC’s only boutique running studio experience. 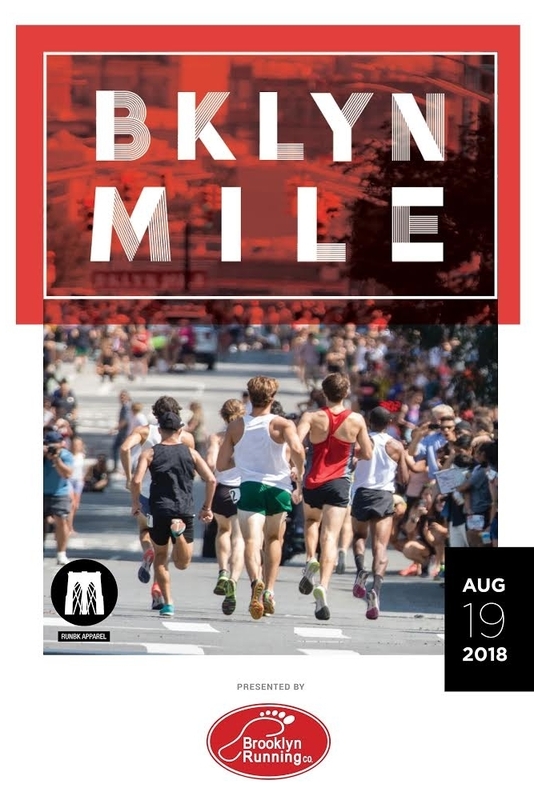 Next Friday evening (7/27) at 7:15pm in Mile High's NOHO location, there will be a Brooklyn Mile-focused class taught by Coach Raj. And it's a charity run! JOIN US at SoulCycle's NOMAD Studio for a full-body workout through indoor cycling in support of Girls on the Run NYC's mission to inspire girls to be joyful, healthy, and confident! By riding with Girls on the Run NYC, you're helping to build the leadership of girls throughout our city. Lace up, clip in, and join a community of Girls on the Run NYC supporters for an exhilarating night ride with SoulCycle NOMAD. Riders must be at least 4'11" and at least 12 years old to ride. *Please note, for any rider under 18, a parent or guardian will need to sign a waiver in person. *Tickets are non-refundable. If you cannot attend, your ticket will be processed as a donation to Girls on the Run NYC. * 100% of the proceeds from this ride go to Girls on the Run NYC, supporting our mission to build a world where every girl knows and activates her limitless potential and is free to boldly pursue her dreams. Stay tuned for a list of group runs hosted by friends & partners in NYC! Happy Global Running Day! Save the date for our Spring Season 5k - June 3 on Roosevelt Island! Get ready for the celebration, starting and ending near Firefighters Field. Registration is now open at gotrnyc.org/5kinfo. Join us for the 2018 Shape Women's Half Marathon on Sunday, April 15! 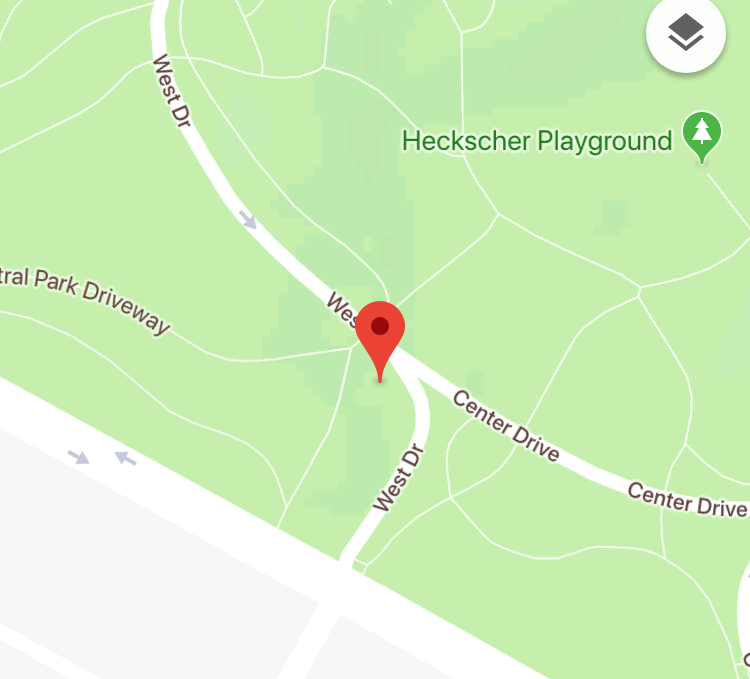 The SoleMates Committee will be hosting a cheer station located at West Dr and Center Dr in Central Park (just north of the 7th avenue entrance to the Park)! Help us celebrate the amazing achievements of the women running in the 2018 Shape Women's Half Marathon! After the Race, there will be a coffee meet up for our Spring 2018 Coaches to meet and share about the season so far! Cheer for our 2018 NYC Half Marathon Team SoleMates! Join us on Sunday, March 18, starting at 8 am at the northwest corner of 58th St and 7th Ave. Look for our cheer team wearing pink headgear -- and wear your pink & green too! Do you have entry into this race already, and want to join our Team SoleMates? Learn more & register for our team here. On February 25th, join us for the final class of our February Fitness Series, Wukkout! Wukkout! is an hour long Caribbean based dance fitness class designed by Krista Martins, to make you have fun and sweat just like you would if you were at Carnival! Find your groove while increasing your fitness level with body sculpting "wining" techniques that give you an intense, total-body, aerobic workout to soca, calypso and chutney music. Class begins with a warm-up which will teach you how to "juk", "wuk" and "wine" and continues into a variety of dance combinations to the latest soca music. All levels are welcome and no prior experience is necessary. On February 18th, join us for the third class of our February Fitness Series, Yoga, Meditation, and Refresh! Our Sunday morning yoga and meditation class offers you the ability to unwind and recenter. Our instructor, Ko, is a yoga teacher and meditation guide who sometimes jogs in one place. She uses mindfulness to ground, center and uplift her practice of inner compassion, patience and inquiry. She will guide you through the hour long class, focusing on building resilience and revitalization at the entry-point (and high stress point) of your week. You’ll be surrounded by a community of GOTR supporters, building positive energy for your week ahead. No experience is necessary. Simply show up, sit down, and take some much needed time for self-care. On February 11th, join us for the second class of our February Fitness Series, Vinyasa Flow Yoga! Vinyasa flow is a creative, energetic, yoga class that incorporates purposeful sequencing that unites body and breath. The instructor offers a strong attention to alignment to allow you to safely flow, dive into the deeper layers of your practice, and create a space for healing to occur. Modifications are offered to make this challenging class accessible to all students familiar with yoga basics. Join us at the Girls on the Run NYC 5k! We believe everyone who participates in our 5k – whether they run, walk, hop, skip or cartwheel across the finish line – is to be honored and congratulated. The Girls on the Run NYC 5k celebrates our girls and their 10-week season of learning about the importance of taking care of our emotional and physical health. We invite you to join us in this season of celebration! For more information on running or volunteering at the 5k, visit our 5k page!